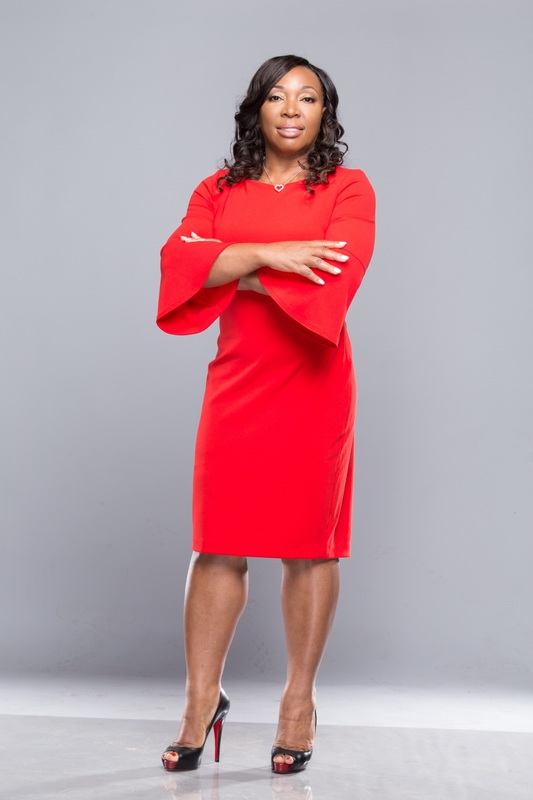 Yvette Gavin is an elite business development strategist, certified leadership and personal development trainer, international speaker and the founder of Yvette Gavin Consulting, LLC. She is notably known for her work with the United State Government, her facilitation of leadership workshops for the U. S. Consulate in Brazil, the Centers for Disease Control, and The Georgia National Guard, and her overall ability to build thriving workplaces through dynamic training programs. Yvette is known for her ability to build high-performing Information Technology (IT) teams that deliver exceptional quality. She has held progressive leadership roles at Lockheed-Martin Aeronautical, Delta Air Lines, AT&T, Cbeyond, and Cox Communications. 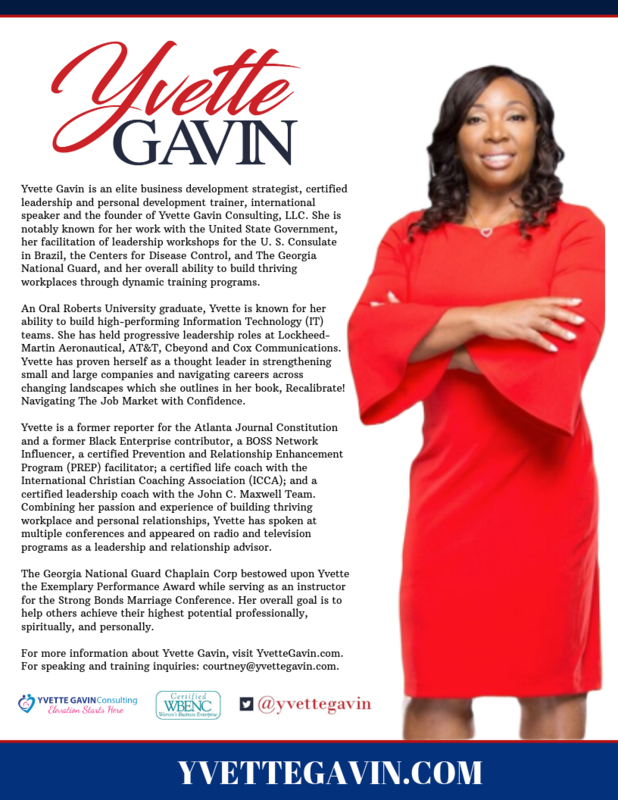 Yvette Gavin is an expert in growing small and large companies and navigating careers across changing landscapes which she outlines in one of her books entitled Recalibrate! Navigating The Job Market with Confidence. Yvette holds a B.S. degree in Communication from Oral Roberts University in Tulsa, OK, and is the recipient of various leadership and community awards. She received the Leadership Excellence Coin from the 78th Aviation Troop Command for her dedication to providing relationship training to Georgia's Soldiers, she is the recipient of the State of Georgia Governor's Award for Outstanding Leadership and has received numerous leadership and process improvement awards from various fortune 500 companies. In addition to being a respected business strategist and career advisor, Yvette is a BOSS Network Influencer. She is also a former Black Enterprise Magazine Contributor and a reporter for the Atlanta Journal Constitution and the Birmingham (ALA) News; as well as, a CNN Headline News (HLN) editor and manager of the Southeastern Bureau. She is an accomplished author, a certified Prevention and Relationship Enhancement Program (PREP) facilitator; a certified life coach from the International Christian Coaching Association (ICCA); and a John C. Maxwell certified trainer, speaker, and coach. In addition to writing Recalibrate! Navigating The Job Market with Confidence, she also authored What to Do After You Say I Do, combining her passion and experiences of building thriving workplace and personal relationships. As a leadership expert, Yvette has spoken at multiple conferences and appeared on radio and television programs as an advisor. Additionally, the Georgia National Guard Chaplain Corp bestowed upon Yvette the Exemplary Performance Award while serving as an instructor for the Strong Bonds Marriage Conferences. Her overall goal is to help others achieve their highest potential in their business, spiritual, and personal life. Yvette's career and life's work covers a broad spectrum of successes that speaks highly of her talent and commitment to excellence. She is married to James Gavin and they have an adult son, daughter-in-love, and grandson. The Gavin's enjoys traveling and entertaining family and friends. For all inquiries contact courtney@yvettegavin.com.